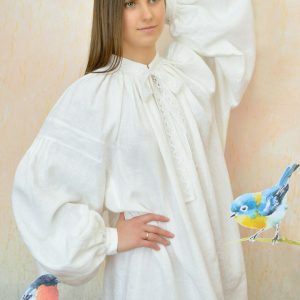 Every nightgown made by Madde is unique and it has it’s story – a copy of a pattern was found in a History Museum of ancient Latvians, another pattern was drawn from an original Victorian nighty that was bought in an antique shop in England, some other designs were made by Madde designer who finds her inspiration in the beauty of the old. Madde nightgowns reveal the glamor of the antique to the contemporary woman. 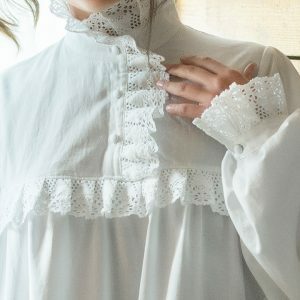 They create a special feeling for the one wearing them, telling fascinating stories and just for the night letting the woman feel how would it be to become a Victorian lady, an ancient Latvian farmer’s daughter or a duke’s lover. All Madde nightgowns are handmade, using only natural materials like light cotton, fine linen or silky viscose. Madde nightgowns are comfortable to wear, easy to wash and made according to the highest quality standards. We support sustaining the Earth by using only natural materials and packaging, we practice fair trade with all our local workers, we value friendship, honesty and equality with everyone we encounter in our work. The shipping is on us! We offer free shipping all across the world for all nightgowns, nighties and combinations. The world is the limit! If our product doesn't fit or is not quite as you expected - no worries - we will cover the postage if you return the product with all the tags on within 30 days after the purchase. There is something blasé about nightwear today. It is considered to be comfort wear, a pair of women’s boxers and that t-shirt you got free on holiday. Often, the nightwear sections of vintage are left sleeping on their hangers. After all, who cares what you wear when nobody is around? This was never the point of nightwear. Gowns and robes were designed to be intimate, luxurious and feminine attire and a symbol of rest, relaxation and seduction. A woman should be two things: classy and fabulous. You can be gorgeous at thirty, charming at forty, and irresistible for the rest of your life.